An ancient mystique is one ingredient luring me to a foreign land. The island of Lesvos proved bewitchingly alluring, not least because it is home to the oldest known female poet in history, Sappho, born in 628 BC in the town of Erassos. A second beckoning ingredient is a land’s potential for adventure travel, and Lesvos delivers on this count. Also known as Mytilini, Greece’s third largest island has a network of at least 400 miles of well-maintained paved roads. With my Trek 1220, two panniers and a tent, I spent two weeks bicycling to just about every town and village in the island accessible by asphalt. With great relief, I hereby broadcast that as a single female traveler, I was never once harassed, disturbed, or pestered by any man. Although Mytilini with roughly 90,000 inhabitants certainly has its share of foreign visitors, compared to Cyclades islands such as Santorini and Mykonos, its tourism falls short of industry proportions. There are pockets of tourist activity where mostly northern Europeans cluster, yet more common are the countless empty beaches that render bikinis cumbersome. I slept on many such beaches, my tent pitched within spitting distance of the Mediterranean. The twelve-hour overnight ferry from Athens deposited me in the capital, Mytilini, at 8:00 in the morning. Upon touching terra firma, I set off cycling up the island’s eastern flank taking a leisurely pace to check out several monasteries or marvel at the tantalizing views of Turkey, a mere two hour boat ride away. The silence of a lone highway was often startlingly ruptured by a clamorous clink-clank-clink of metal bells dangling from a herd of twenty or so goats. 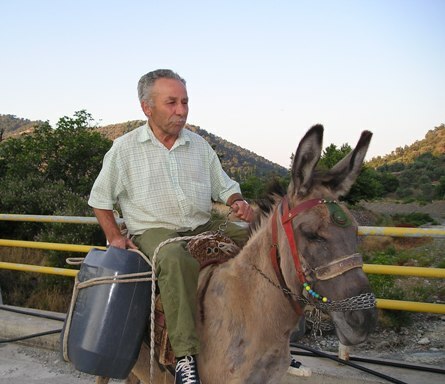 The click-clack of old men riding donkeys side saddle is also a frequent sight for a road cyclist. By 6 p.m. my first day, 40 miles later, I arrived to the adorable fishing village of Skala Sikaminias where I camped for the night. 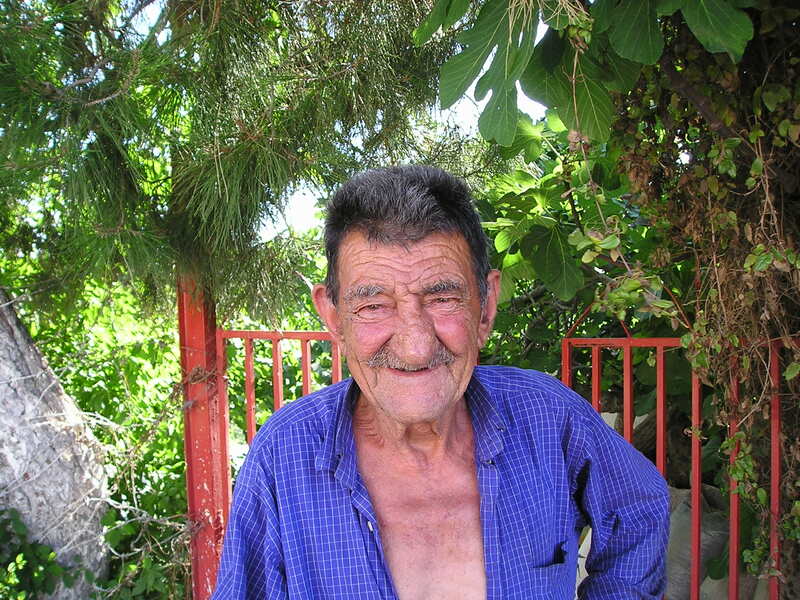 Its parent town, Sikaminias, is two steep miles away, comprising maybe 900 inhabitants. When summer comes many of the villagers of Sikaminias move down to Skala Sikaminias, and when summer ends, they ascend back up the mountain. 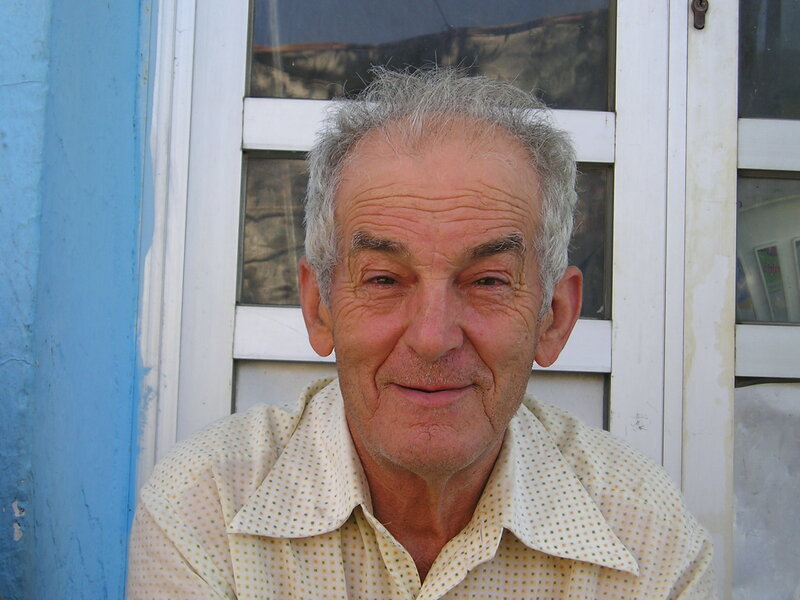 I was told about this unique seasonal movement by a resident of Eressos and Skala Eressos. 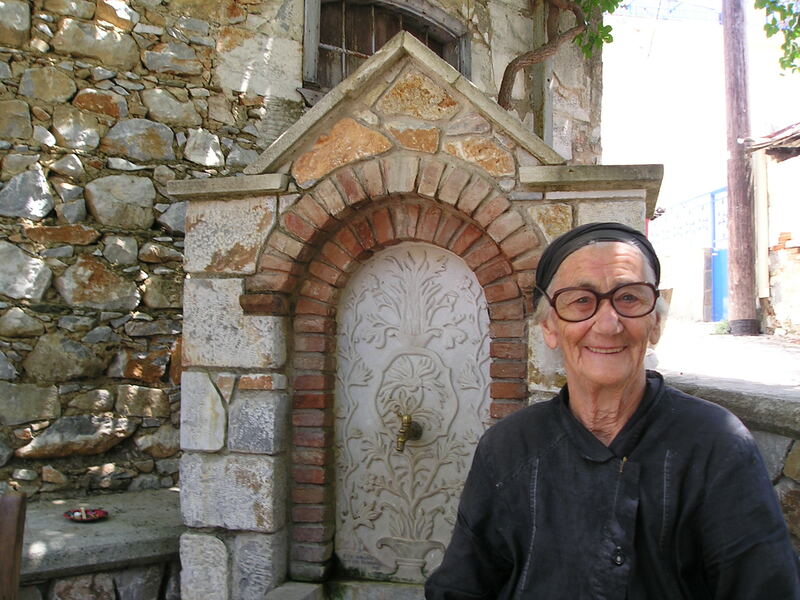 She said that until only four years ago for decades her entire village — including merchants, doctor, pharmacy, post office — made its annual mountain-sea-mountain relocation en masse on the very same day. From Skala Sikaminias, I traveled about ten miles westward on a gravel road hugging the sea to photogenic Molyvos, (population about 1400), a town which under no circumstances can be missed. Its winding, narrow cobblestoned streets and elegant stone houses with loudly painted shutters set against the blinding blue sea and an imposing castle make Molyvos a destination for the romantically inclined. On that rocky coastal road to Molyvos I came across hot springs that are not “tamed” so to speak, meaning no one has enclosed them. They are just out there in the sea, no building, no sign, no fees, no people. You wouldn’t even know to look for them except that I got a “heads-up” from a local dispensing sketchy, but correct instructions – look for steam arising out of the sea near a white boat and a big rock not far around the bend. I sat in bliss in hot water rising from the earth, my back resting against a smooth rock, savoring the tingling feeling of cool sea waves lapping over me. 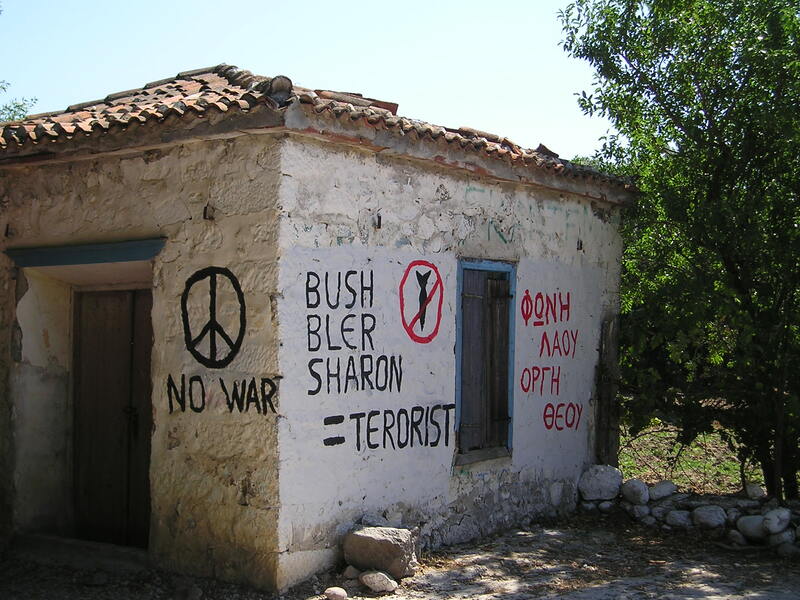 I visited many mountain villages of 200 or 300 residents, places like Pterounda or Ambelika or Pelopi whose Dukakis Street is named for a certain American because this is his ancestral home. These are towns by and large ignored by European vacationers since the beach is their premier attraction. Each village has a little plateia (square), usually with a vine-covered canopy for cherished shade. Mandatory are several coffeehouses, called kafeneions, where the men sit for hours drinking thick Greek coffee from doll-sized white demitasse cups, “Mavro,” they’d order (black). I would bicycle into a village, often turning a narrow corner, suddenly appearing into the plateia rather dramatically from nowhere in stark contrast to the noisy announcement of a car or motorcycle. I was invariably told that I was the only bicyclist in memory to ride into town. My presence always created a hubbub and soon the routine litany of questions would begin in this order: Where are you from? Where is your husband? Do you have any children? After a while, I would leave the center of gravity of the town, the plateia where the men dominated, and start venturing down the village’s side streets where the women prevailed. I would find them at home, sewing, cooking, relaxing on porches, or tending to animals. Young and old, seemed dazzled by my female presence on a bike. “All alone?” the women always asked in seeming admiration. A glass of water, fruit, a towel to wipe my sweat were offered to me when I visited women in their homes. I was never looked at suspiciously or with a glare of distrust. A smile always greeted my smile, coupled by direct and forthright eye contact. The shape of Lesvos can be likened to an upside-down uterus with the Kalloni Gulf marking the dividing line between the verdant, watery east and the dry, arid west. Helpful to a cyclist, even in the barren west, is the ubiquity of potable water. Every town has at least one public fountain, and often you find running water in the middle of absolutely nowhere and refreshingly cold. While cycling in a pulverizing sun which Greeks have sense enough to stay out of, I’d dunk my head under the spigot and the rush it created was enough to keep me cycling until the next fountain. This island has many novel surprises, such as, the petrified forest near the western town of Sigri whose “trees” still stand (in contrast to Arizona’s rock-forest all lying on the ground). Migrating birds from Africa make the island an internationally desired venue for birdwatchers. The aromatic pine forest mountains in the south can make a mountain biker delirious, while Kelloni Gulf, looking and feeling like a big lake, offers great windsurfing and is famous for its sardines. 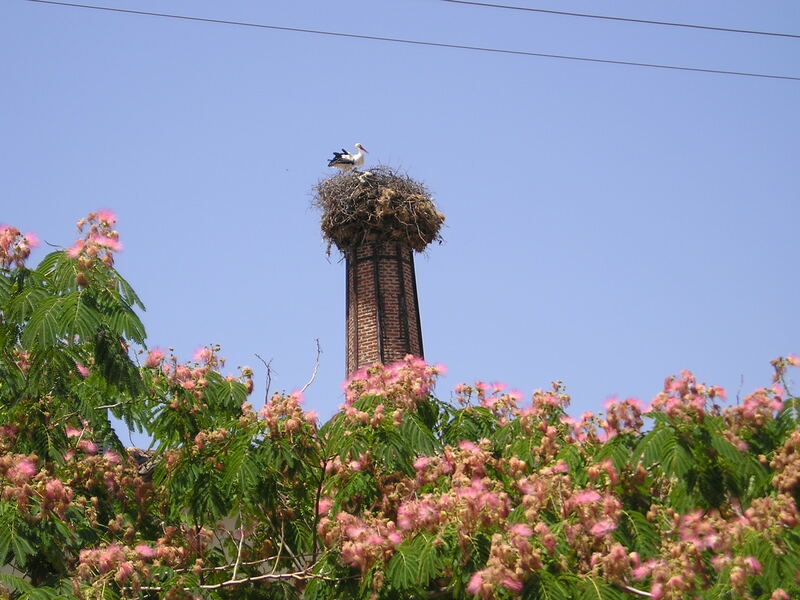 Equally noteworthy is Lesvos’ flora. Near Molyvos I unexpectedly set my tent next to a bush of wild rosemary and I’m certain its heady fragrance infiltrated my dreams for the two nights I camped there. One day on an isolated road I encountered a smiling man (where had he come from?) carrying a little green and lavender sprig. He handed it to me saying, “mentha,” which my dictionary translates as peppermint. I carried the wild twig in my handlebar bag for days, whiffing its energizing scent regularly. 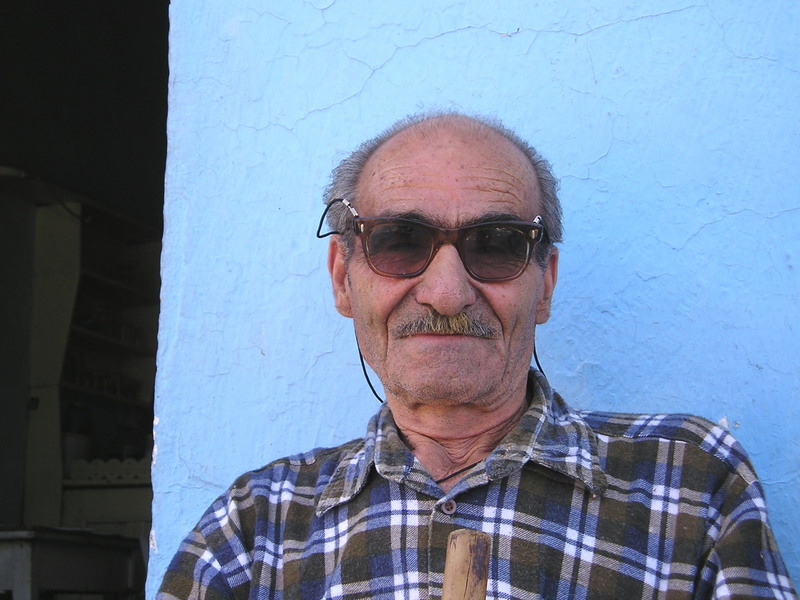 In an adorable fishing village, Niferida, an old woman cooked louloudia. This uniquely delicious plate consists of the bright yellow/orange flower of the zucchini plant rolled up in a conical shape and stuffed with rice and herbs. I’d never seen or tasted anything like it. 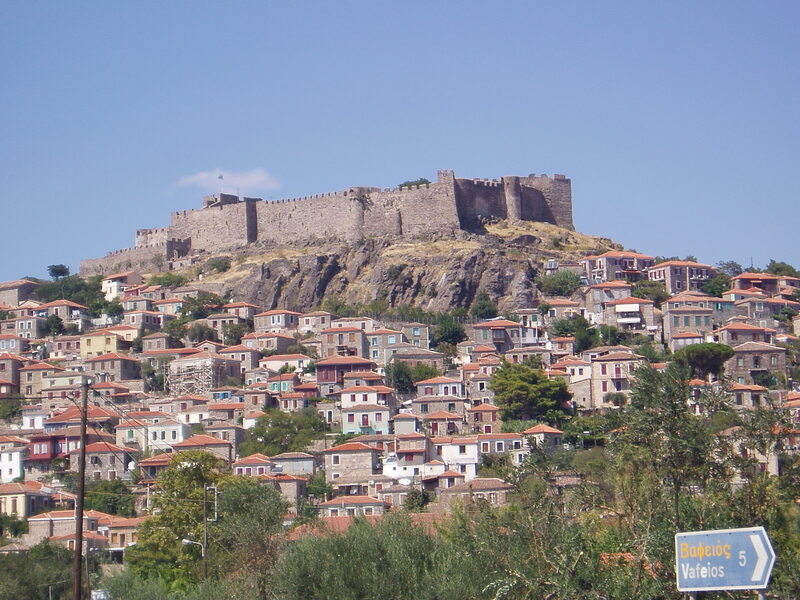 If you like ouzo, then head to Lesvos and specifically to the town of Plomari in the south where it was born. There are actually certain brands of ouzo that can only be purchased in Plomari. Just as wineries are to be found in Santorini, ouzo factories invite you in to taste their brand. Visitors to Lesvos regard this precious island as one of Greece’s best kept secrets. The people are warm and friendly. The food is divinely delicious in part because Mytilini produces some of Greece’s finest olive oil. There are as yet no high rise hotels or packaged jumbo jets of tacky tourists trampling all over the place. I didn’t meet a single American until I took a day-boat to Turkey at the end of my trip. For you women adventure travelers on the look-out for a female friendly, mountain-sea locale that offers physical challenges and an unobtrusive charm, Lesvos is waiting to unleash your goddess spirit. From Plaka, a pretty town north of Agio Nikolaos in eastern Crete, the island of Spinalonga looks invitingly close. Just a hop, skip and a paddle away by sea kayak—or so it seemed. Spinalonga is a spit of land situated at the mouth of Spinalonga Bay. Strategic since antiquity, in 1579 the Venetians erected a gargantuan fortress befitting of their superpower status, and indeed, its protectors defied Turkish conquest for several decades longer than any other Cretan garrison. The fort finally fell to Ottoman rule in 1715. 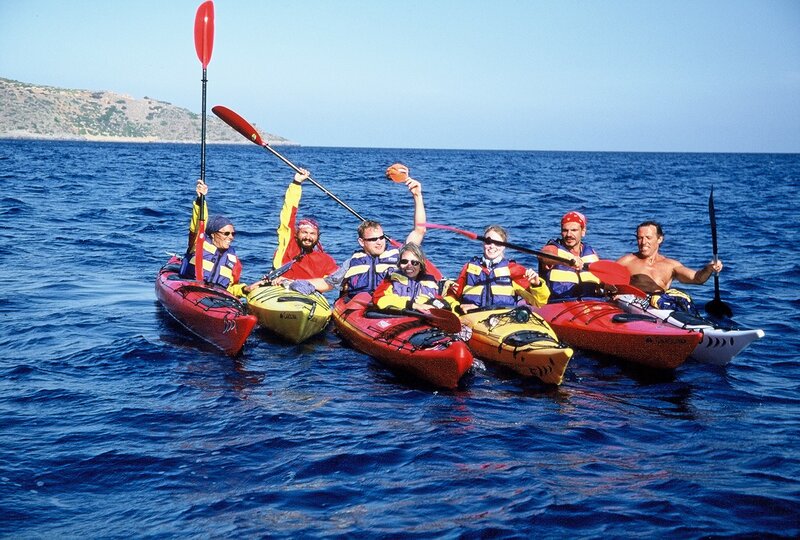 On a warm October day our energetic group of four Americans and four Greeks sought to kayak over to Spinalonga Island. 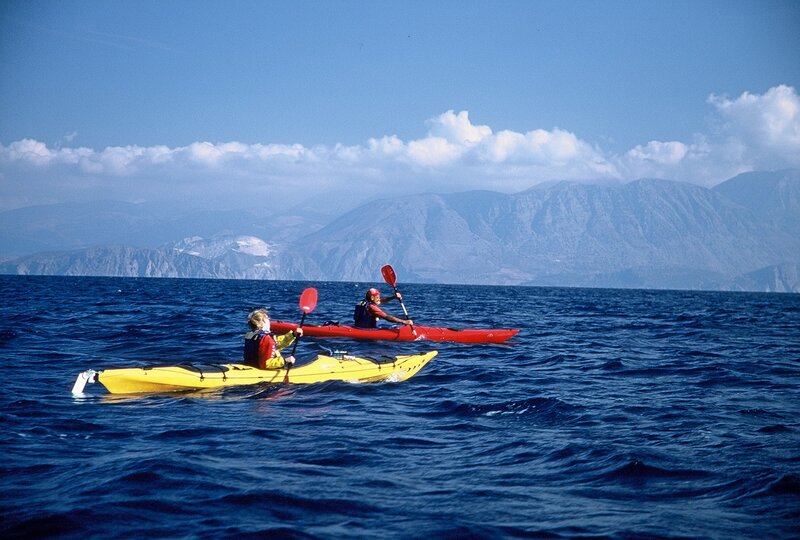 From there, we would head down its bay, a short portage, then down Poros Bay to Agio Nikolaos. At most, the trip was fifteen kilometers. 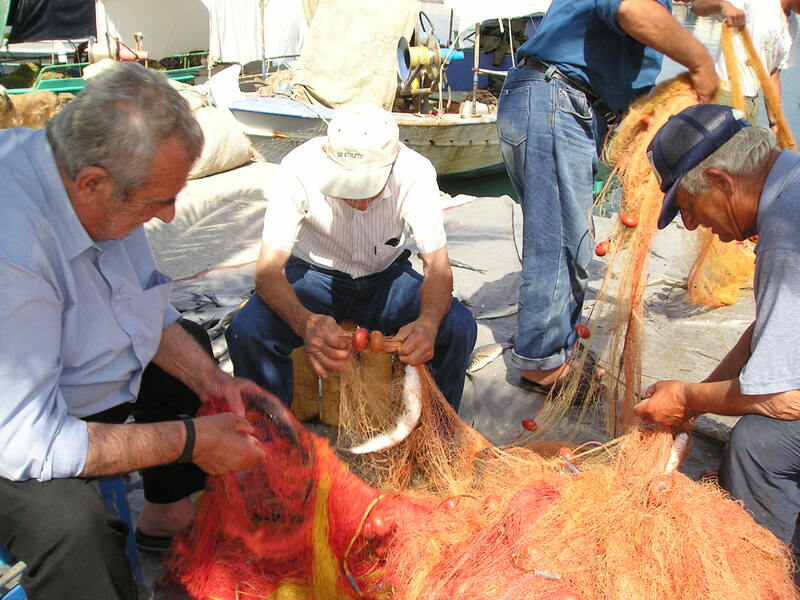 From Plaka, a local fisherman can probably make the voyage to Spinalonga Island in about twenty minutes. It took me about two hours. I should point out that I had never kayaked. My initial hour was spent on land just trying to get a grasp of this sport and its paraphernalia. We donned life jackets, colorful wetsuits and learned how to put on a “skirt.” This is a sturdy cloth worn around your waist: when seated in your kayak, you attach the skirt’s hem to the open perimeter of your seat so that water doesn’t enter the boat. Next were some rudimentary rowing lessons. We sat on the beach, pretending we were at sea, and went through the motions of manipulating the oars. I reasoned that, being a first-time kayaker, I should buddy up with another novice, Pia, in a two-seater. Wrong. Pia and I didn’t know when to paddle, how to coordinate our rowing or even which direction to face when a strong wind blew. Not but fifteen minutes after setting out to sea, one moment we were dry, the next moment we were wet. The boat capsized so suddenly we didn’t even have a chance to shout the proverbial “Man Overboard!” Sobered by the incident, we took our friends’ advice and got our own kayaks, and discovered that individual navigation was superior to teamwork, at least when the team was clueless in the art of kayaking. When I learned that Yiannis capsized in his kayak, too, I was beginning to fear our excursion would match the disasterous pre-Games rowing test events for the Athens Olympics which took place in August, 2003. The new rowing center at Schinias was vulnerable to the maltemia, the summer winds, which created whitecaps and forced Olympic officials to call off the opening day of competitions. Later, winds still dominating, the United States rowing team actually capsized. What a photo that made for the Greek press! Within a day of their arrival the entire German rowing team, heretofore ranked number one, fell ill with food poisoning and immediately retreated back to Germany. I prayed our rowing adventure would not suffer similar afflictions. Finally, we all made it to Spinalonga Island, some of us quite wet and all of us looking a little goofy in our loudly colored outfits, especially the kayak mini-skirts. The tourists stared, mostly at Miltos. While our skirts laid flat, his undulated with a flamboyant pink hem akin to an Argentine tango costume that got shrunk at the cleaners. For some reason, he kept it on during our visit to Spinalonga which prompted endless guffawing. After Crete formally united with Greece in 1913, Spinalonga became a leper colony and remained so until 1957. The island is larger than expected when you peer at it from the Crete mainland. One can easily spend several hours strolling its pathways and perimeters. The elegant Venetian architecture—curved arched portals, for example—contributes to Spinalonga’s beauty, yet a haunting feeling pervades, perhaps attributable to the cemetery whose open graves bear the assumingly impaired bones of the prior inhabitants. My afternoon kayaking was far more successful once I got the hang of it. And the disappearance of the winds helped appreciably. Our group soared along pretty much all together instead of scattered leagues apart as we had been during the morning. The scenery in Spinalonga Bay is breathtakingly spectacular. Mountains in the distance on a blinding shiny blue sea devoid of any other seafarers except the eight of us. The rock cliffs on the coast mesmerized me: they were wavy, in layers, like slabs of thick uncooked bacon stacked on top of one another, truly of postcard caliber. One area we paddled to appeared as if we were sheltered inside a cave, but actually we were in an open area on the sea. 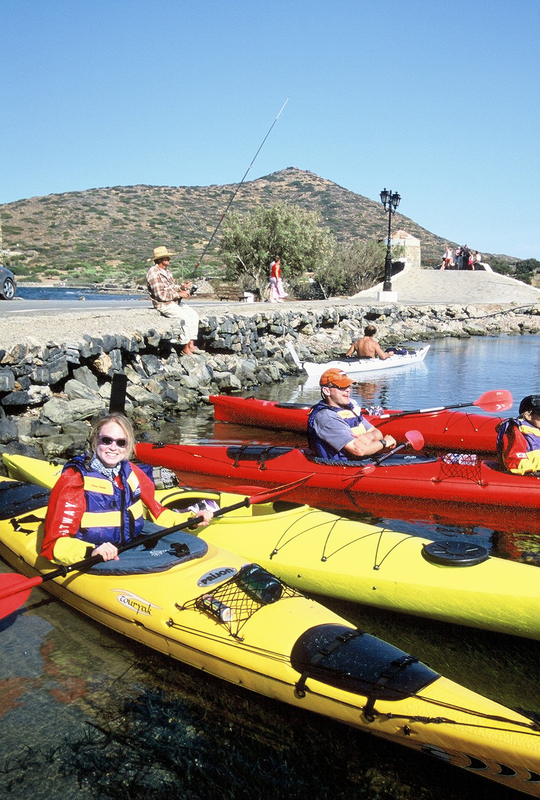 I eagerly recommend sea kayaking in Spinalonga Bay. 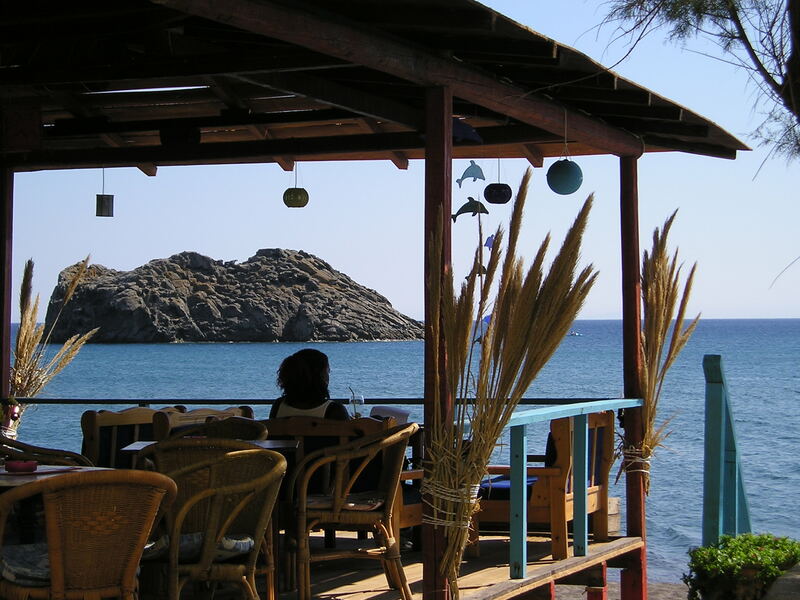 Beginners can complete the journey from Plaka to Agio Nikolao, with a pit stop on the island, easily in one day. You will feel thoroughly exhilarated by the hearty aquatic workout and gain yet another reason to place Crete at the top of your Magnificent Mediterranean Islands List.